Your family membership helps provide uniform and equipment replacement for all sports. 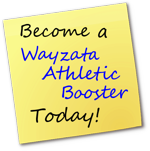 Individual teams use Wayzata Athletic Booster funds for special team needs such as: additional coaches, specialized training equipment, and score boards. Game programs, seasonal posters, and promotional items are also funded by your membership. Please note: There is a $2.50 convenience fee charged for each on-line membership registration. ©2019 Wayzata Athletic Boosters / SportsEngine. All Rights Reserved.